^ Morgunova & Khokhlova 2013. ^ Lazaridis 2016, p. 8. ^ 4.0 4.1 4.2 Haak 2015. ^ Nomadic herders left a strong genetic mark on Europeans and Asians. 2015-06-10 [2018-10-21]. （原始内容存档于2018-09-29）. Haak, W.; Lazaridis, I.; Patterson, N.; Rohland, N.; Mallick, S.; Llamas, B.; Brandt, G.; Nordenfelt, S.; Harney, E.; Stewardson, K.; Fu, Q.; Mittnik, A.; Bánffy, E.; Economou, C.; Francken, M.; Friederich, S.; Pena, R. G.; Hallgren, F.; Khartanovich, V.; Khokhlov, A.; Kunst, M.; Kuznetsov, P.; Meller, H.; Mochalov, O.; Moiseyev, V.; Nicklisch, N.; Pichler, S. L.; Risch, R.; Rojo Guerra, M. A.; 等. 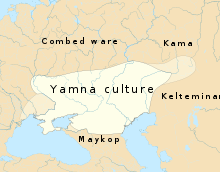 Massive migration from the steppe was a source for Indo-European languages in Europe. Nature. 2015, 522: 207–211. Bibcode:2015Natur.522..207H. PMC 5048219. PMID 25731166. arXiv:1502.02783. doi:10.1038/nature14317. Jones, Eppie R. Upper Palaeolithic genomes reveal deep roots of modern Eurasians. Nature Communications（英语：Nature Communications）. 2015, 6: 8912. Bibcode:2015NatCo...6E8912J. PMC 4660371. PMID 26567969. doi:10.1038/ncomms9912. Lazaridis, Iosif. Ancient human genomes suggest three ancestral populations for present-day Europeans. 自然 (期刊). 2014, 513: 409–413. Bibcode:2014Natur.513..409L. PMC 4170574. PMID 25230663. arXiv:1312.6639. doi:10.1038/nature13673. Morgunova, Nina; Khokhlova, Olga. Chronology and Periodization of the Pit-Grave Culture in the Area Between the Volga and Ural Rivers Based on 14C Dating and Paleopedological Research. Radiocarbon. 2013. doi:10.2458/azu_js_rc.55.16087. Zimmer, Karl. DNA Deciphers Roots of Modern Europeans. 纽约时报. 2015. DNAeXplained – Genetic Genealogy, Yamnaya, Light Skinned, Brown Eyed….Ancestors?? ?